Providing you the best range of stainless steel trophy with effective & timely delivery. 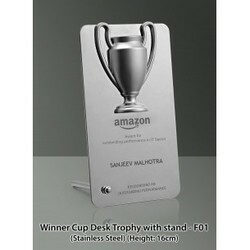 -Stainless steel trophy with a hand carrying flame on a podium style base. -Stainless steel trophy with a podium base and a top of golf stick and ball.